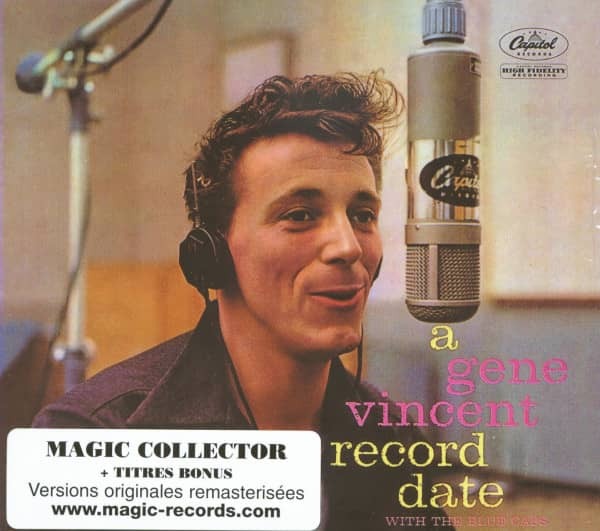 Eugene Vincent Craddock was born on 11th February 1935 in Norfolk, Virginia. Actually the precise order of his forenames has been the subject of some discussion over the years, and when Gene filled out his application for a social security card, he gave his name as Vincent E. Craddock and although 11th February appears on his birth certificate, his mother continually claimed that it should have read 17th, while his sister Evelyn favoured 22nd. That was how it always was with Gene. Nothing was quite the way it seemed and even the simplest things had a habit of ending up in dispute. He enjoyed an unremarkable childhood and never progressed beyond an eighth grade education, eventually dropping out and enlisting in the navy at nearby Richmond, Virginia on 19th February 1952 at the age of seventeen. After basic training, he was assigned as a deckhand on USS Chuckawan and in time upgraded to become a boiler man. He would fill the long hours on board by singing and strumming his guitar but only for relaxation and never with any thoughts of fame and fortune. His one passion, other than girls, was for motorcycling. By mid 1955 he had upgraded from his first small bike to a powerful Triumph and had effected a transfer to shore duties where he was working as a despatch rider attached to the naval base in Norfolk. The episode which changed Gene Craddock's life forever occurred in July 1955 and as usual there are several different versions of the incident. It is however generally accepted that a woman driving a Chrysler jumped a red light and a sickening collision left him with a permanent injury to his left leg which had been almost severed just above the shin. The doctors favoured amputation and with hindsight this would have been the best option, but he always fought against the ultimate solution and consequently lived the rest of his life in various degrees of pain. For six months he was in and out of Portsmouth Naval Hospital, hobbling around on crutches with his whole leg encased in plaster. This already serious injury was made worse because of his apparent unwillingness to rest the wound and on several occasions the doctors were obliged to re-set the leg because it was not healing satisfactorily. During the period of his recuperation another event took place which was destined to shape the future of Gene Craddock's life. For two nights on 11th and 12th September 1955, Elvis Presley came to Norfolk and Gene was among the capacity audience at the City Auditorium as teenagers rioted and mobbed him, literally tearing his clothes apart for souvenirs. The audience reaction to Presley must have had a dramatic effect on the youngster, whose own career prospects were no longer looking very promising. From then on, singing rock 'n' roll was all that Gene ever wanted to do with his life. Presley's appearance in Norfolk, Virginia had been sponsored by a local radio station, WCMS, and when in February 1956 they called for neighbourhood talent to audition for a new show, 'Country Showtime,' Gene overcame his shyness and sang Presley's song Heartbreak Hotel, creating sufficient impact to qualify for the finals which were held at the Carnival Room in Norfolk. This time he performed an unknown song Be-Bop-A-Lula, backed by the Virginians, who were the WCMS house band and included one, Ervin Williams, in their line-up on rhythm guitar. 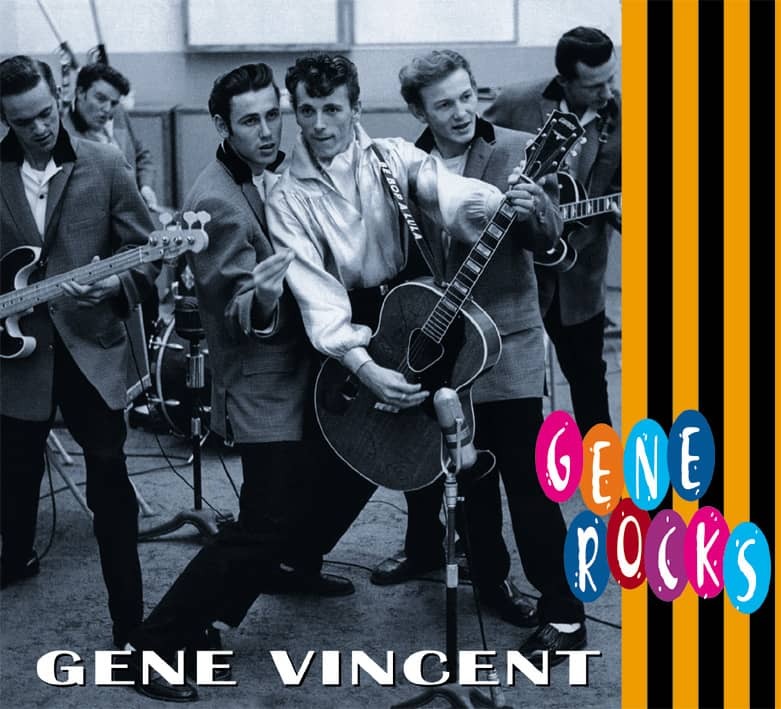 Gene caused such a stir that he and the Virginians quickly became regulars on 'Country Showtime' and even played a few live shows at a local car lot on the weekends. It was WCMS disc jockey Bill 'Sheriff Tex' Davis who had the foresight to really kick start young Gene Craddock's career. A few months earlier he had made brief contact with Ken Nelson of Capitol Records at the Disc Jockey Convention in Nashville. He rang through to him in California and was greeted with unexpected enthusiasm. RCA had recently purchased Presley's contract from Sun and with their greater financial muscle and superior distribution network were rapidly elevating him to stardom. Capitol did not have any rock 'n' roll singers to compete with RCA and although Ken Nelson had no personal interest in the music, he was astute enough to realise that they needed to climb aboard this latest bandwagon, and quickly. Sheriff Tex Davis gathered together a group of local musicians which comprised Ervin 'Willie' Williams from the Virginians on rhythm guitar, lead guitarist Cliff Gallup, Jack Neal on double bass, plus fifteen year old school boy, Dickie Harrell on drums and on 9th April, they recorded a demo of Be-Bop-A-Lula which was duly dispatched to Nelson at Capitol. For three weeks they heard nothing, but when he finally called, it was an excited Ken Nelson who invited them to Nashville to make a record. The whirlwind that became Gene's life had begun and he was totally unprepared for what was about to happen. They arrived in Nashville on 3rd May and holed up at the Andrew Jackson Hotel until the following day, when they would record one of the popular music's greatest records, an anthem of rock 'n' roll. This inexperienced gaggle of musicians who had hardly played together and really had little idea what they were doing, were about to hit the jackpot. Ken Nelson was having second thoughts about the whole project and fearing that this unpromising looking troupe would be less than competent, had assembled a team of session musicians to accompany Gene. There was however one ace in their pack and that was guitarist, Cliff Gallup. As soon as he started to play, the session musicians were sent home and Nelson pinned all his hopes on the five of them. Cliff Gallup was something special and he would in time be recognised as one of rock music's great guitarists. It was indeed fortunate that he was at Gene's side at this vital time of his life. 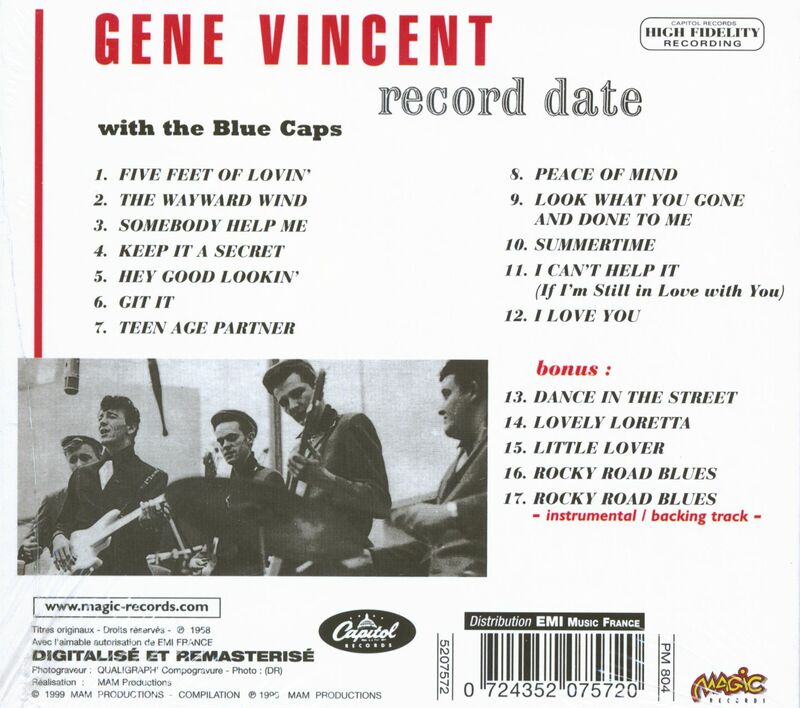 Customer evaluation for "A Gene Vincent Record Date (CD)"